A new Statistics Canada report reveals, building permits rose by 2.6 per cent in November 2018, to $8.3 billion. 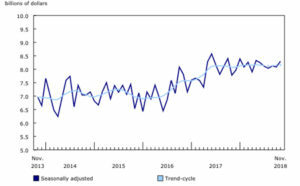 Canadian municipalities issued $8.3 billion worth of building permits in November 2018, up 2.6 per cent from October. According to a Statistics Canada report, higher construction intentions for commercial buildings drove most of the gain. The value of nonresidential building permits rose 11.6 per cent to $3.3 billion. Construction intentions rose in five provinces, with British Columbia accounting for most of the gain. In the commercial sector, the value of building permits was up 16.8 per cent to $2.1 billion, the highest level since May 2007. The increase was led by higher construction intentions for office buildings in Vancouver and Québec. Following three consecutive monthly declines, the value of industrial building permits rose 21.9 percent to $527 million in November. The increase can be attributed to permits for new agricultural buildings.